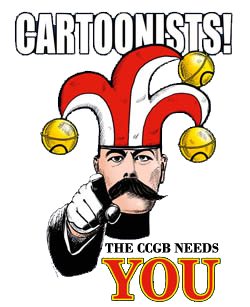 You are here: Home › Articles › The Jester › Shrewsbury International Cartoon Festival 2015: The Chairman’s Report! 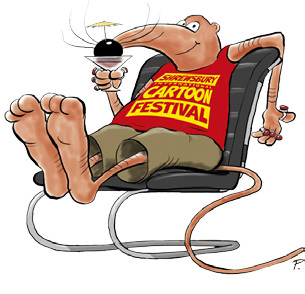 Shrewsbury International Cartoon Festival 2015: The Chairman’s Report! This article first appeared in The Jester issue 487. The Festival used to be a two day event. 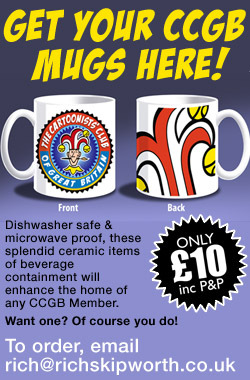 We had funding from Shrewsbury Council and other sources that allowed for payment of accommodation for Cartoonists, equipment, materials etc. Alas, we have become victims of Government cutbacks in recent years, which removed our financial support from the Council. This led to us having to reduce the Festival to a one-day event to conserve our finances. Amazingly, it all still worked brilliantly! 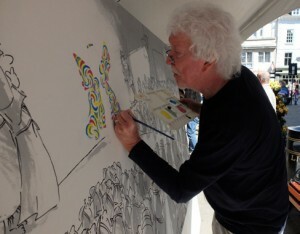 The one-day version of the Festival seemed more focussed, more intense, but just as enjoyable. This year’s Festival was no exception. I’m happy to report that our 2015 public cartoonfest was a big success! Again! 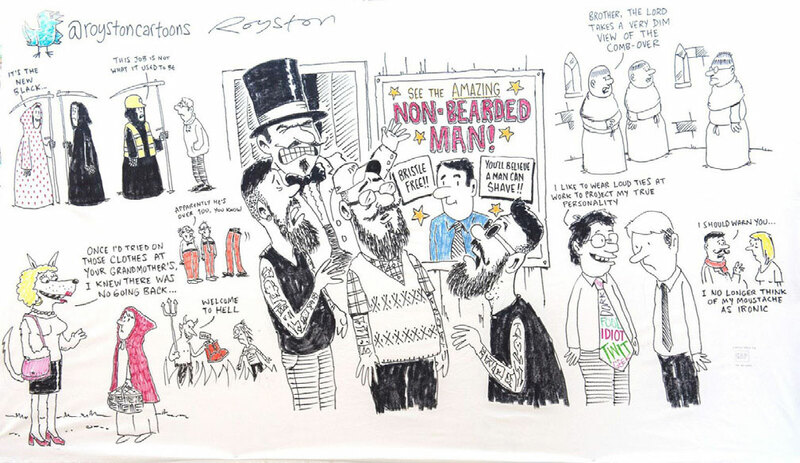 This year saw the introduction of an unusual sight: me in a suit giving a speech… The Festival proper is officially started with a private viewing of the Festival Cartoon Exhibition held in the splendid Bear Steps Gallery. 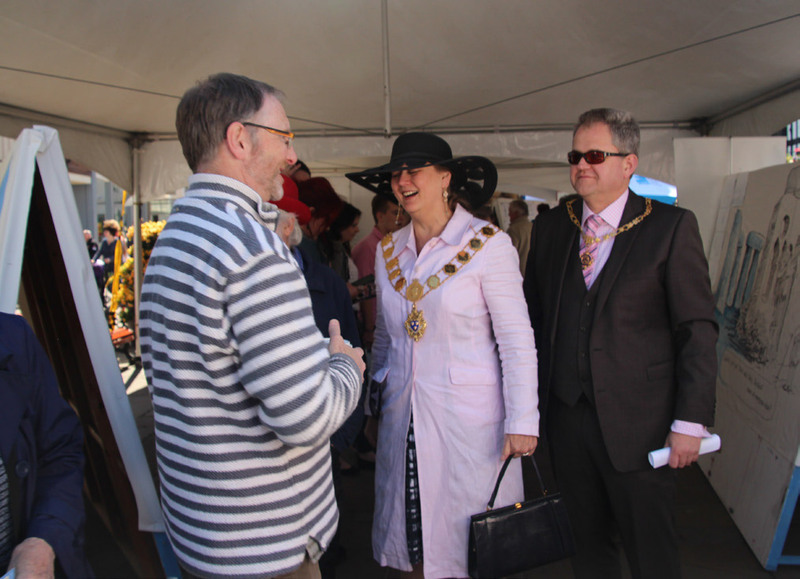 The free wine, beer, and the splendid array of nibbles, (and of course the splendid cartoons) attracted a huge crowd of cartoonists which made it difficult for me to spot our guests of honour, Deputy Mayor Miles Kenny and Deputy Mayoress Aurona Kenny. 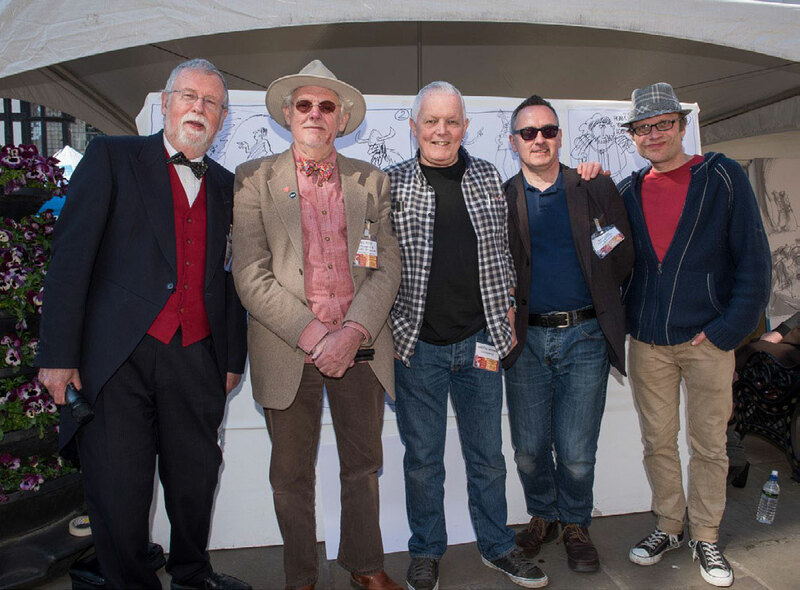 I shouldered my way through the cartoonist army who greeted my besuited appearance with gasps of “Bloody Hell” and “Jesus!” I’d had a wash and a shave too, just to give a more impressive effect. I located the Deputy Mayor & Mayoress, had a very pleasant chat with them and duly gave my speech to the assembled multitude. There was applause (phew!) and the 2015 Festival was underway! Firstly the Techno Tent made its debut. 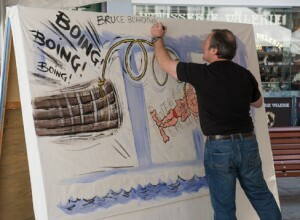 This was a tent where we were able to demonstrate the dark arts of digital cartooning. The splendid people from Shrewsbury’s prime Apple reseller, AT Computers, supplied us with two top spec high resolution 27 inch iMacs, and Wacom supplied us with two huge top of the range Cintiq digital tablets. We had the iMacs linked to the Cintiqs with their displays mirrored so that the general public could see what was being drawn on the Cintiqs. This event generated a huge amount of interest from the public, and the Techno Tent was constantly full of parents and kids all wanting to see how it was done. 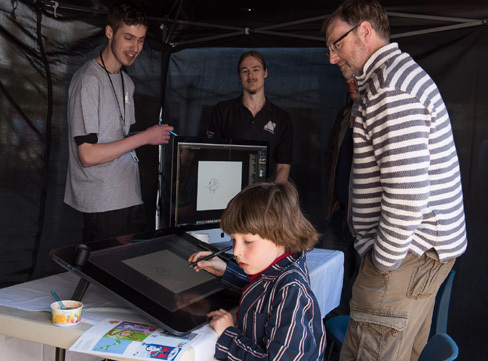 There was a lot of hands-on experience for everyone, with everyone being fascinated by the ability to draw on the Cintiq and see the image appear. Myself and Anthony Smith were the demonstrators, with technical backup from Will Higgins at AT and Sian Maskell from Wacom. One small child was watching me draw for a several minutes. I thought he was entranced by my digital mastery…then he looked up at me and said, in a rather petulant tone, “Have you finished yet?” He wanted a go. I was elbowed out of the way to make way for this budding cartoonist. Bless ‘im. 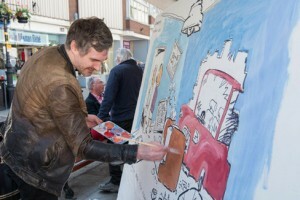 The second innovation to the programme was Joe Coulman’s 3D stop motion animation workshop. Joe is a new recruit to the committee and ran a really well attended introductory workshop on the basics of animating blobs of plasticine and other stuff using Macs, digital cameras, and animation software. 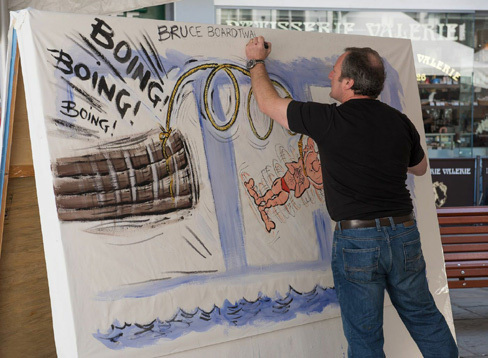 The third new feature we added was “Cartoon Busking” whereby a number of seasoned pros would draw up cartoons on A3 sheets and hand them out at random to the public…for free! That sort of behaviour goes against the grain a bit for the hard bitten professional, but hey, it was The Festival. The Big Boarders this year were: Steve Best, John Landers, Robert Duncan, Rupert Besley, Roger Penwill, Carol “Surreal” Isaacs, Alex Matthews, Clive Goddard, Royston Robertson, Martin Newman, Des Buckley, Tim Leatherbarrow and stepping in at the last minute like the hero he is, Matt Buck. The day’s activity was pretty much rounded off by the performance of another Penwill & Stott “Melodrawma” This was a script of sparkling wit and humour read out by Rog Penwill and illustrated at high speed with A3 cartoons drawn by such cartoon legends as Noel Ford, Martin Newman, Royston Robertson, and Will Dawbarn. It was great. The sun shone all day, and it all went off without a hitch. 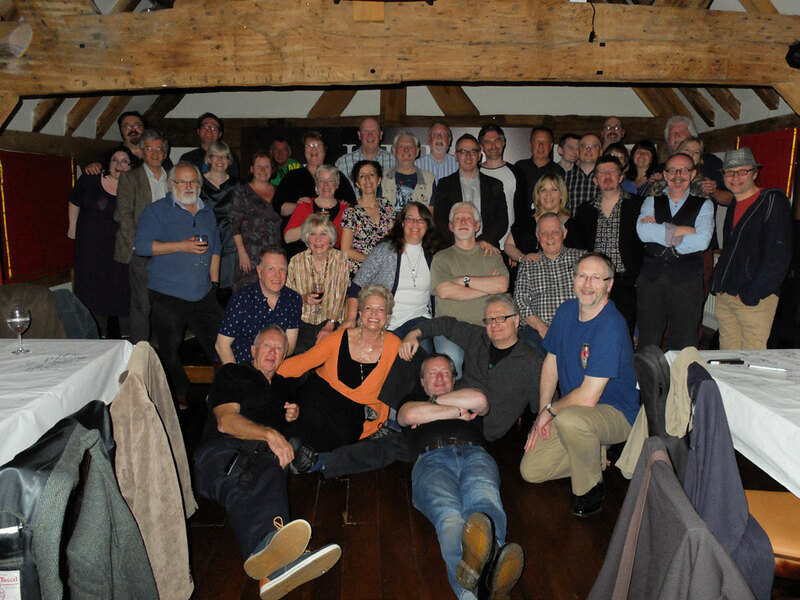 This was down to the splendid efforts and hard work of the Festival Committee: Alison Patrick, Bill McCabe,Bill Stott, Chris George, John Roberts, Karen Lloyd, Noel Ford, Cherryl Rowlands, Sarah Knapp, and Joe Coulman. Next year, it’s going to be bigger and better. Funding is looking promising, sponsors may be forthcoming, and a feeling of optimism is in the air. And my suit still fits.